The Grand Prix of Belgium meant a return to a former happy hunting ground for Monster Energy Dixon Racing Team Kawasaki and the sand of the Lommel circuit was again the domain of Max Anstie. The 22 year old swept to Pole Position and then cleaned up both MX2 motos to repeat his 2014 victory at the venue and celebrate his second overall triumph of the year on the KX250F. 24,200 spectators surrounded the largely flat but physically and technically demanding course that is routinely used by teams and riders that flock to the area as a training and testing facility. Lommel was perhaps at its most difficult for a number of years for the fourteenth round of eighteen in MXGP. Anstie set out his intentions on Saturday by taking the lead almost immediately in the qualification heat race and then running undisturbed to the flag for this third consecutive Pole Position. 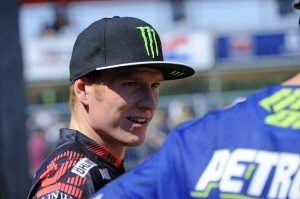 He made no mistake at the start of the first moto on Sunday and in warmer temperatures. Again it was Pauls Jonass who offered the stiffest resistance to his ideas for glory but within three laps ‘99’ had clear track and a free roost zone behind. Anstie began to construct a safety margin of time and distance over the Latvian and eventually triumphed by almost twenty-five seconds. It was his fourth chequered flag from the last five motos. Later in the afternoon he repeated the act – with another holeshot to-boot – and refused to let anybody else share centre stage. It was the second 1-1 for Anstie in the space of three Grands Prix and he has been the dominant rider of the series of late. The repercussions of Lommel mean that Anstie sits seventh in the MX2 standings and just 46 points away from the red plate. Four rounds and 200 points are left to be won. After a relentless schedule of Grand Prix events and Maxxis British Championship fixtures Monster Energy DRT Kawasaki can now catch their breath as the calendar pressure eases for the next two weeks. MXGP builds up again with consecutive races in Italy and Holland starting on the 22-23 of August. This entry was posted in Home and tagged 2015, belgium, bike it, cosworth, fim, kawasaki, lommel, max anstie, motocross, mx2, steve dixon, youthstream on 24 August 2015 by admin.